Joanie is thankful for her Gremmie. Mr. and Mrs. Potato Head are going to watch him today. Joanie is going for a dental and to have two little spots removed. A few years ago, she had a mast cell tumor on her face that I had removed. These look similar so I want them off too. If you could spare a prayer and some purrs it would be greatly appreciated. And we are thankful to Teddy’s mom who comes up with the best photo prompts for Sammy’s Poetry Day . a little gossip they would seek. while the kids went out to play. this was before the invention of a hard drive. but it is why the ozone is deplete. This photo reminded me of my Mom’s beehive hairstyle in the 1970’s. I loved it- I could spot her anywhere. She actually still goes to the hairdresser weekly, but not for a beehive. 🙂 I always tease her about hairspray depleting the ozone, although the kind they make now is completely useless so I doubt it is doing environmental harm. 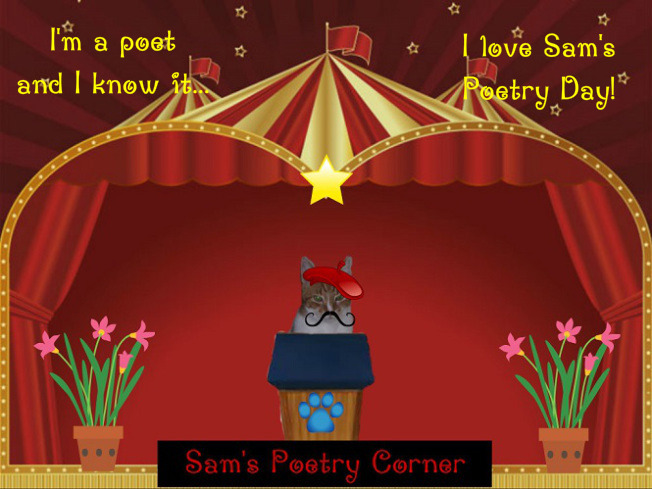 This entry was posted in Blog Hops and tagged Brian's Thankful Thursday Blog Hop, Gremmie, Joanie, Sammy's Poetry Day by pilch92. Bookmark the permalink. Oh, PIpo will purr hard for Joanie…hope those spots will just bu innocent. And after the dental she will have a sparkly set of pearls…and we hope none will be stolen. POTP from all of us. I’m sending purrs to Joanie, and I hope she heals fast from her procedures. I am sending good thoughts for Joanie’s dental. I remember sitting in a row under those huge dryers wondering if my head would explode from the heat. It is a wonder we had any hair left after torturing it with such heat, back combing it to within an inch of it’s life, then coating it in a hard shell of hairspray! HA! That’s a fabulous poem for the photo challenge this week. My Mom’s Mom always had “untouchable” hair after the beauty parlor visits – it was frozen in place until the next week when she’d go through it AGAIN. As for sweet Joanie – we will have her in our prayers today and hopefully her little bumps are just little “age” bumps! Sending hugs………..
My mom still does that, but the modern hairspray doesn’t hold well 🙂 XO and love to you both. Purrs and prayers for you sweet Joanie, your photo is so, so sweet. 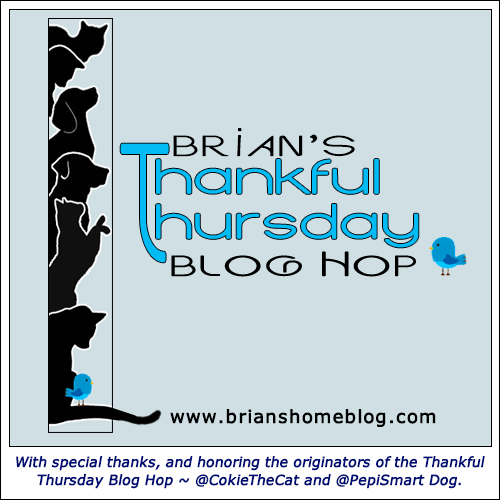 Thanks for joining the Thankful Thursday Blog Hop. We’re sending Joanie a ton of purrs and hope all goes well for her. We sure send lots of good thoughts to you Joanie for a good visit to the vet. Hope all goes well. Joanie, we hope you have an uneventful and successful surgery today. We don’t blame your mom at all for having those spots removed. We would too! Purrs and hugs for Joanie! I still have a bonnet hair-dryer from my youth! Prayers and purrs for Joanie today. I’m sure she will be fine. Love your poem. My mom never went to a hairdresser when I was growing up. I do remember those dryers though. I’m all ready for Friendly Fill-ins. Great questions. Oh to have been a fly on the wall when those women starting wagging their tongues. Great poem! Mom remembers her Mom and Grandmom going every week! Her Mom would wrap her hair in toilet paper and a hair net to keep it from getting messed up. we forgot to say we are sending purrs and prayers for Joanie. We hope Joanie procedures go well. We know it has to be a worry. Great poem – Mom remembers when her Mom would sit under one of those contraptions. We are sending many, many purrs and prayers to Joanie! She deserves lots of rest, so hopefully Mr. and Mrs. Potato Head will help keep Gremmie busy for her. And, as always, I adore your poem! I’ve seen old photos in which my grandma was donning a beehive hairdo. That sure was a unique look! Then again, people of the future might look at photos of people’s hair from these days and think we were something special. Warm wishes to all of you! Purrs and Prayers for Joanie! Sweet picture. Praying those spots are nothing, and i hope Gremmie behaves for Mr. and Mrs. Potato Head. We’re sendin’ lots of hugs and purrayers that all is well and Joanie will have a speedy recovery. I hope Joanie’s visit to the dentist and doctor went okay and all is well, and she is back home with her Gremmie. LOL! I remember my mom having a beehive “do” as well in the 60s and 70s. So glad they have NOT come back into style! Thank you 🙂 Me too. We are sending purrayers that Joanie’s appt goes well, and that Gremmie behaves for the Potatoheads ! Loads of purrs and prayers headed her way! We’re purring for the best for Joanie! Lots of prayers coming your way! I know Gremmie will be there when you get home. Sending healing purrz for Joannie! Poor Joanie! We hope her procedure went well today. We have been purring and praying lots. I hope all went well for Joanie! Since I’m behind and reading in reverse, I’m glad to already know that Joanie did well with her procedures. Lumps and bumps…ugh…it seems so common with pets, though we’ve had it far more with dogs than cats. I thought I was the only one who thinks hairspray is useless now. I’d rather have limp hair than no ozone, but they need to take it off the market.